Sublime, meditative, and mutable, “Coexistence” by Mineo Mizuno is on view at Samuel Freeman from February 14 to March 21, 2009. For Mizuno, a ceramic artist whose mastery of glaze is equaled only by a reputation for continually pushing artistic boundaries, “Coexistence” is an unorthodox, but not entirely unexpected, new direction. 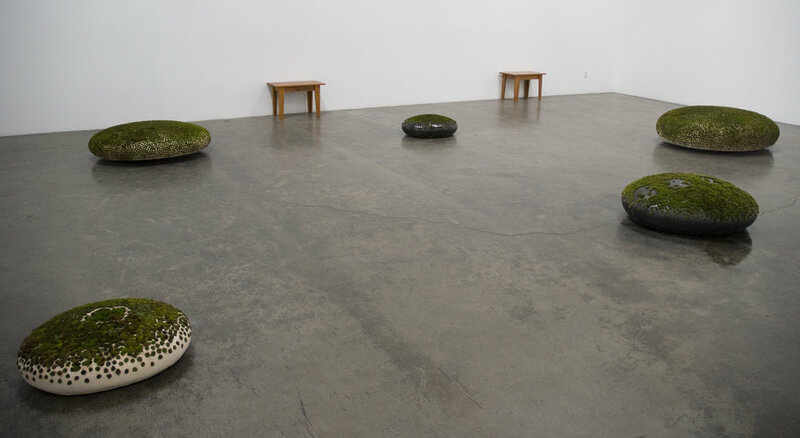 Mizuno begins each ceramic and moss piece in “Coexistence” with a lozenge-like flattened spherical form, ranging from one to four feet in diameter. 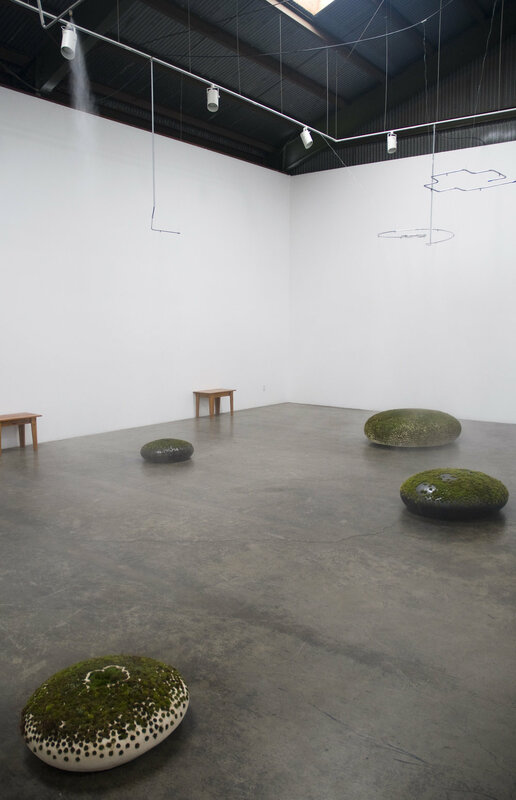 Similar in shape to the “water drop” works Mizuno last exhibited at Patricia Faure Gallery in 2005, these pieces are then dotted with shallow holes, in which the artist plants moss. 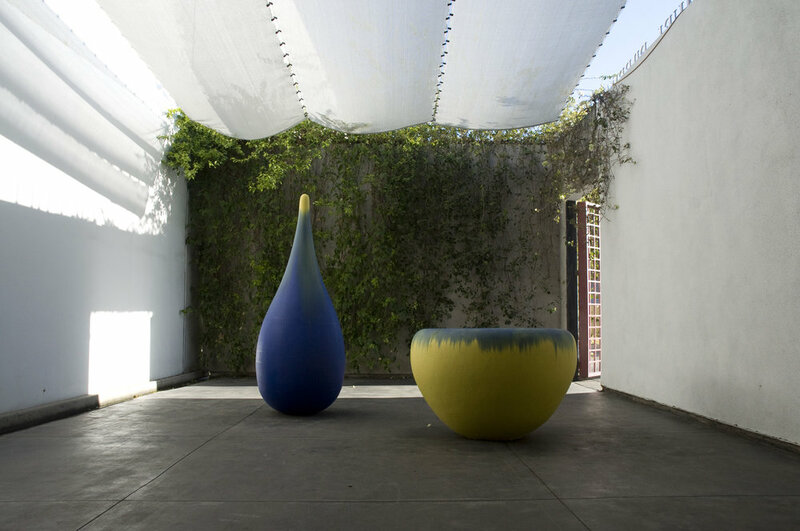 Finally, after a strict regime of shade and mist, the moss grows into a protective organic outer covering, akin in function to a traditional glaze, but ever responsive to the transformative effects of temperature and precipitation. This elegant integration of ceramics and horticulture was inspired two years ago by landscape design work Mizuno was doing at the time, followed by a trip to the artist’s native Japan. For four decades, Mineo Mizuno has played a major role in elevating the perception of ceramic arts from high craft to fine art. After studying with Ralph Bacerra at Chouinard Art Institute in the late 60s, Mizuno attempted to distance himself from a Japanese aesthetic by focusing on tight, refined, pop-inspired work. While he has done “traditional” ceramic work off and on – he’s created customized dinnerware for the likes of Vidal Sasoon and chef Hiro Nishimura – Mizuno spent much of the 80s and 90s exploring new directions in form, function and glaze. Over the years, Mizuno’s work has tended in an increasingly personal direction, as he has turned to defining aspects of his own heritage: landscape (“California Landscape” in 1987), family (the “Zero” pieces in 2003), and now horticulture.